If you stock Bottle Branch products in your shop, or you’re thinking about stocking Bottle Branch products, I’m here to help! Below are a few ways you can familiarize yourself with Bottle Branch products and the story behind them. 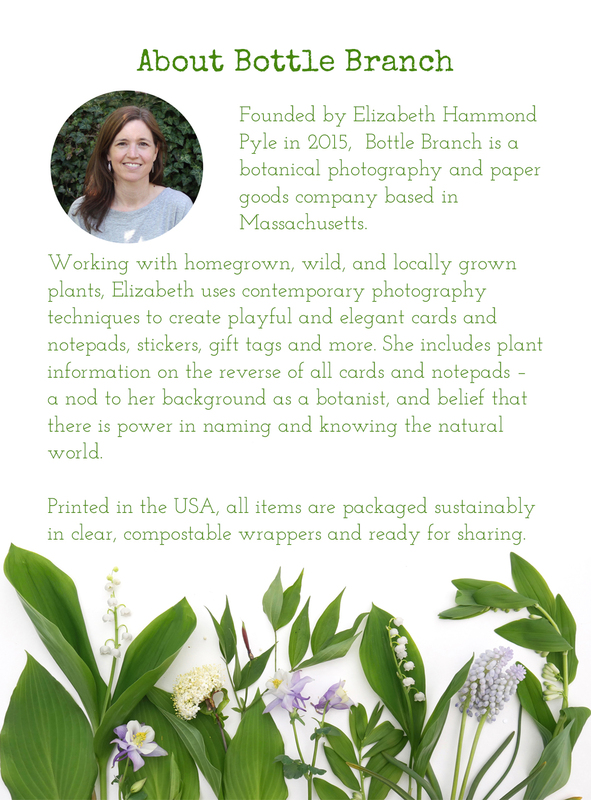 Bottle Branch is the botanical photography and paper goods company founded by Elizabeth Hammond Pyle in 2015. Working with homegrown, wild, and locally grown plants, she uses contemporary photography techniques to create playful and elegant cards and notepads, stickers, gift tags and more. She includes plant information on the reverse of all cards and notepads – a nod to her background as a botanist, and belief that there is power in knowing (and naming) the natural world. Printed in the USA, all items are packaged sustainably in clear, compostable wrappers and ready for sharing. Born and raised on the eastern shore of Maryland, Elizabeth Hammond Pyle spent much of her youth roving around her small town and exploring fields and woodlands. She studied biology as an undergraduate and went on to receive her master’s degree in Botany. In her 20s, she conducted research projects in Bolivia, Puerto Rico, Brazil, Canada, New England, and in the American South. In 2009, she resigned from her research job to pursue the creative life, as well as care for her four children. After dabbling in printmaking, needlework and botanical illustration, she fell in love with botanical photography and, in 2015, founded Bottle Branch, her small botanical photography and paper goods business. From compostable packaging to recycled materials, read more about how Bottle Branch stays green here. Curious about other shops that carry Bottle Branch? Visit my Stockists page here.